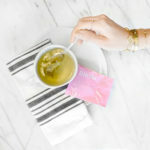 Did you just arrive in paradise only to find your bikini body is bloated from travel – Bikini Tea will get your tummy flat again! I used this after a friend recommended it and it worked and tasted great. Works great to get rid of the bloat during the first few days of your trip.